Tim Reid receiving a certificate from Eric Hutchinson MHR. RECENTLY announced Federal funding of $1.1 million will help to build a retractable-roof greenhouse at Reid Fruits in Plenty. 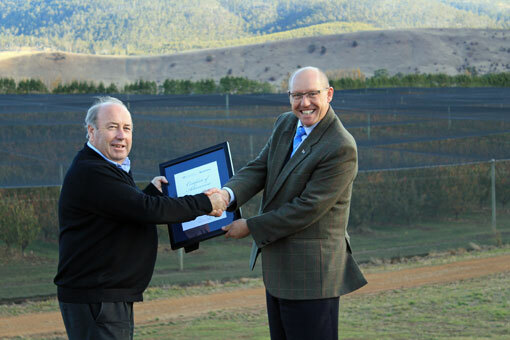 The funding was announced by the Federal Member for Lyons, Eric Hutchinson MHR, who presented Reid Fruits managing director Tim Reid with a certificate of achievement for his firm's innovation and investment. The company will build a $4.4 million non-traditional high elevation orchard at Plenty, including a retractable-roof greenhouse to mitigate weather risk which will extend the cherry season in Tasmania. Reid Fruits exports cherries to more than 20 countries across Europe, Asia and the Middle East and is one of the biggest cherry producers in Australia. The Reid family’s involvement in the state’s fruit industry started in 1856 when James Reid settled in the Huon Valley and planted his first apple orchard. The family orchards have expanded with each generation with Reid Fruits turning its attention to cherries in 2000. Since expanding into the Derwent Valley in the 21st century, more than 80,000 cherry trees have been planted at Plenty along with 36,000 apple trees. Mr Hutchinson said the Federal Government funding was all about giving financial support to Tasmanian businesses to help generate jobs.